IEEE WIE Affinity group of the IEEE GRIET SB took charge of organizing STAR Program in Zilla Parishad High School (ZPHS), Nizampet, Hyderabad. This program focused on training the students of ZPHS Nizampet on the usage of computers and basics of MS office. The first session of the program was held on the 13th of August 2014 and dealt with the basics of computers. A batch of 10 enthusiastic volunteers took part in the first session of the program. Of these volunteers, some were allotted teaching responsibilities and briefed the students on algorithms and flow charts and the others were assisting them in managing the students. The enthusiastic students were eager to learn what an OS is and our volunteers attended to their doubts. Students listen attentively as they are introduced to the world of computers. 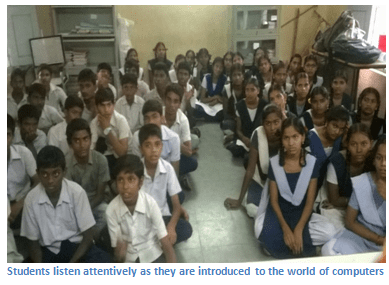 70 Telugu medium students of 10th class were present for the 2:00 pm-3:00 pm teaching session.60 English Medium students of 10th class were present for the next session of the day. The second session of the program was held on the 16th of August 2014 and dealt with training the students in MS Word. A batch of 8 enthusiastic volunteers took part. The students were taught the basics of MS Word, How to write letters, using various types of fonts, alignment of data, including pictures with the text and other basics. 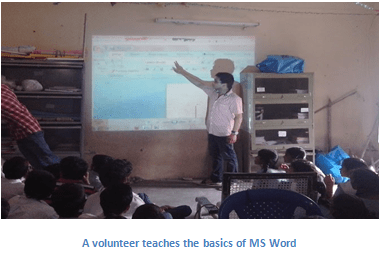 A volunteer teaches the basics of MS Word.70 Telugu medium students of 10th class were present for the 2:00 pm-3:00 pm teaching session. 60 English Medium students of 10th class were present for the next session of the day. At the end of this session, the students put into practise what they were taught and wrote a leave letter in MS WORD. The final session was held on the 21st of August 2014. This session worked towards enlightening the students on MS Excel and MS PowerPoint, the two basic tools of Microsoft most commonly used in the present days. A batch of 8 volunteers took part in the program. The volunteers, distributed themselves into groups of two, took charge of the teaching responsibilities and the others were assisting them in managing the students. 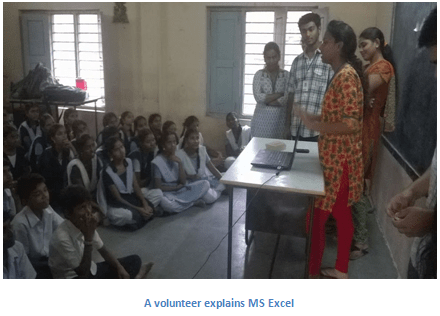 They were taught to work with MS Excel and also what makes an effective power point presentation. The students listened in rapt attention as the volunteers demonstrated on how add effects to the presentation (on how to change font, apply background and add animations). WIE GRIET AG conducted the final of this years’ WIE Star Programme on 26th August 2014. The crux of the day’s session was e-learning. A batch of 8 active volunteers took part in the program. The volunteers engaged the students to an interesting session on the World Wide Web. Firstly, they were taught on how the world is dependent on internet and is a vast platform of knowledge and communication. A volunteer teaches students how to create an Email Id.They were introduced to browsers were taught to how search information on browsers. Next, they were taught about the E-Mail. They volunteers demonstrated how an E-Mail account is created and also how mails are sent and received. 70 Telugu medium students of 10th class were present for the 2:00 pm-3:00 pm teaching session.60 English Medium students of 10th class were present for the next session of the day. Students participating enthusiastically in the sessions. These sessions were interactive and by the end of 4 sessions, the students of ZPHS Hydernagar were well equipped with the basics of computers and the usage of MS Office.